It's a Sunday premiere, and just because my train company declined to inform anyone clearly that they really couldn't be assed running a full service, I had a choice of getting a 6:40am or an 8:30am train in to town to grab a wristband. Being the pessimist I am, I opted for 6:40am, got my wristband at 7:30am and then set about finding somewhere warm to pass the time for a few hours before we were told to be back in line. Crowds were expected to be big, given two stars of the current incarnation of Star Wars are in this movie. "Tom, you know I'm with you and that I'm also all about freaking out the kids. But word's come in, and you really need to change the poster on the main board....."
Green Astroturf and a front row spot that's a bit worryingly close to the 'talent moat' blocking my view of the low stage. Still... if we're lucky they might be handing out fresh vegetables instead of just tote bags and free tickets to see the movie. "Just a reminder Julie, if I see this anywhere on twitter or facebook or instagram, there will be consequences and they will be severe"
"I can't see a thing in this. And you're certain you've dressed me up as a stormtrooper?" - It's Peter Rabbit! And either Domhnall Gleeson is about 3x bigger than the average human being, or this is a larger-than-lifesize Peter Rabbit. "YO : The "LA" is an abbreviation for "Lapin", which is French for 'Rabbit'" - good news: your friend and mine Hakeem Mr Impact and DJ Myxomatosis were on hand to warm up the crowd, dispense fairly accurate geographical information, and even hand out some freeness. 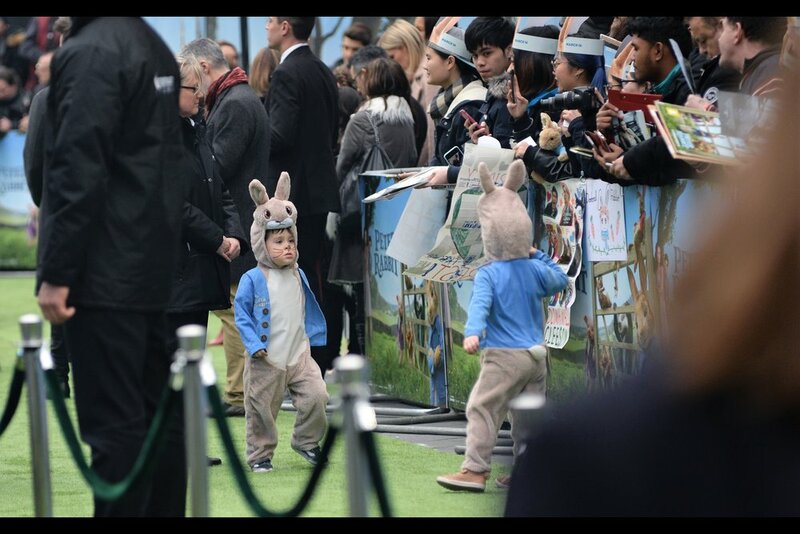 "Mom said you weren't allowed to sign autographs as Peter Rabbit. The lawyers told her and she told you and now I'm going to tell her...."
"Wait... I think I see somebody with an 'Easy A' DVD cover....." - Director Will Gluck also directed 'Friends with Benefits' with Justin Timberlake and Mila Kunis (but hey, I actually liked Easy A). Wearing a dress literally comprised of Daisies, in a fashion so brazen even I can't easily poke fun at it, it's Daisy Ridley! She's the voice of the rabbit Cotton-Tail<TM> in the movie. "You might as well let her finish, because once she starts..." - Domhnall Gleeson is best known as the menacing-psychopath-turned-dumb-comic-relief General Hux in the crazy mixed up mess that is the Star Wars sequel trilogy. I photographed him at the most recent premiere here. "We gave out as many cardboard bunny ears and mini-posters as we could, but as you'll notice most people brought Star Wars stuff for the main stars to sign. Hope you don't mind?" "Mary Sue is a bit of a strong word to describe my character. We are talking about Cotton-Tail, aren't we?" "Sure Rey can fly and fix the Falcon better than Han could, sure she can wield a lightsaber better than Luke Skywalker and without training, sure she can shoot three Tie Fighters in a single shot on her first attempt, defeat royal guards and save Kylo Ren moments after being tortured, get off a disintegrating Star Destroyer unseen and lift a mountain of rocks on her first attempt. But Rey has flaws! For instance, and it's not easy to tell from the movie, but she has terrible morning breath. Now ask me about Peter Rabbit, damnit." "I can't authorise spec scripts for Star Wars, Peter Rabbit, or in theory Hercule Poirot mysteries. Sorry". I photographed Daisy Ridley three times as the Royal Albert Hall last year : at the 2017 Baftas, at Murder on the Orient Express, and Star Wars VIII. "Nothing. Just doing my bit to scare the kids." - Domhnall Gleeson is this movie's antagonist/foil . "Sorry Jenny, I just don't like tediously long event hashtags..."
"I don't do high-fives, bro. But I can do this at a distance... hopefully that's suitable." "Woah.... wait a minute. That was from the wrap party. How did you get this picture?" "Okay, I'm going to let you choose between a stylised flower in the vague shape of a daisy, or my name as the letter 'D'." "Nice of you to offer, but I don't want your handbag. It clashes with the dress. Also how do I even know it's your handbag?" Finally photographed : the voice of this movie's titular hero Peter Rabbit : James Corden. "Look, I can probably plausibly claim to have been in the background of some scenes in Star Wars just so I too can sign some of those very cool cast posters, but the fans have asked me to stop doing that. Mainly because I have a very big signature". I have photographed James Corden before, but I'm struggling to recall exactly where. Possibly the Apple Store event for "Begin Again" with Keira Knightley and Mark Ruffalo, from back when the Apple Store still did movie events. Finally, after being hidden behind crowds and red (green) carpet mingling ticket-holders, I've photographed Australia's Own Elizabeth Debicki! "It's true. I'm tall. Is that a custom pickup line you're using, or do you say that to anyone regardless of height?" Elizabeth Debicki has been in such movies as The Great Gatsby, Guardians of the Galaxy II (the gold-skinned alien queen), The Man from U.N.C.L.E remake and is the voice of "Mopsy" in this movie. "Although this is possibly going to sound weird on the radio if I don't clarify, I like your ears. And I've decided not to clarify"
"I know, it's confusing to me as well" - depending on what part of the crowd you find most authoritative, Domhnall Gleeson's first name might be pronounced "Doe-Nuhh", meaning close to half the letters in his name are silent or absent from the pronounciation? "Flopsy, Mopsy, Cotton-Tail..... uh.... are there seven, like with the Dwarves?" sadly, other cast/voices like Margot Robbie, Sam Neill, Sia and Rose Byrne were not in attendance. But then again, having Harley Quinn Funco Pops, Jurassic Park posters and Vinyl LPs shoved in front of my camera is often a good thing. "Wait a minute... I'm pretty sure there was a hedgehog in there somewhere...."
"Oh, look. Some of the things Daisy Ridley declined to sign...."
"Truthfully, I'm not even sure what I'm looking at. Sure I'll still sign it, though." The crush from behind of people wanting James Corden's autograph was probably third most insistent behind Daisy Ridley and Domhnall Gleeson, but that doesn't mean my camera wasn't pushed down by numerous posters and postcards. So... that was that. Event 1 of 5 in the next 8 days. It won't be easy (not least of which because premieres at The Vue seem to offer a lot less spaces for the public, and the Odeon Leicester Square is out of commission due to renovations, and the Empire/Cineworld is similarly boarded up) - but I'll try. What else would I do... stay home and watch TV?